You know the saying Keep It Simple Stupid? 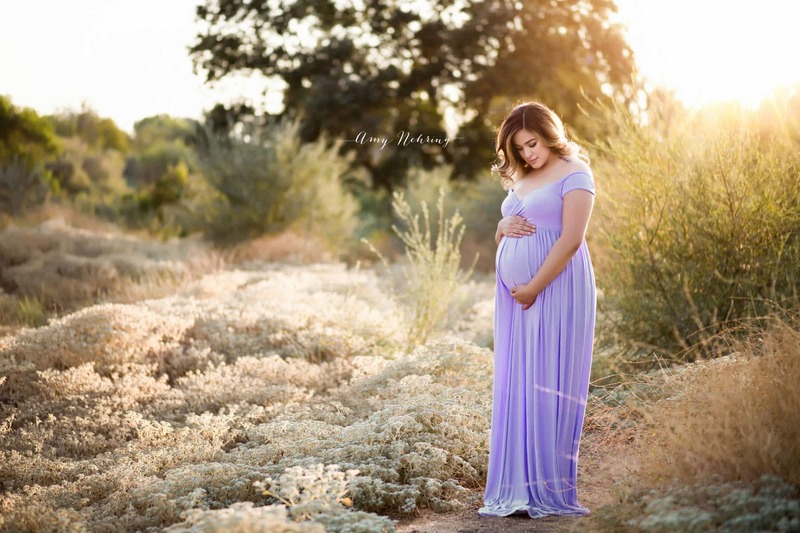 Sometimes, less really is more, and if you ask me, that's certainly true with maternity photography. 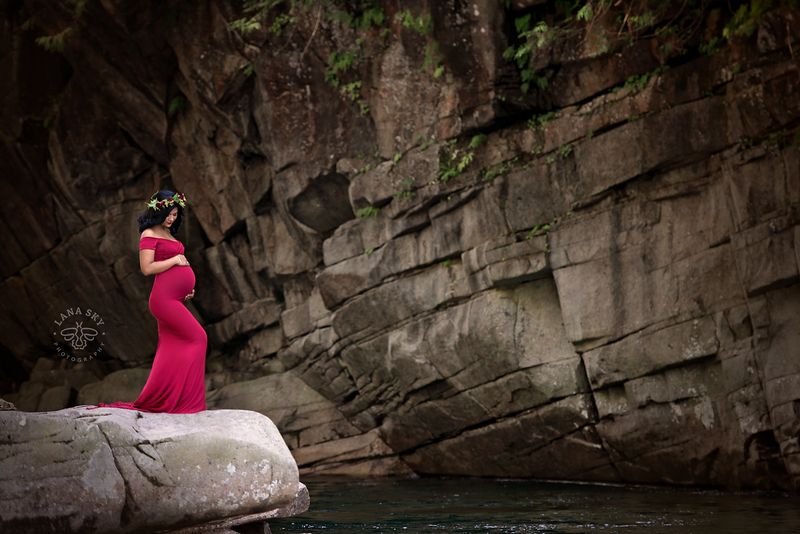 You want the star of the image to be the expecting mom, not all the glitz and glam that you add to the shot. 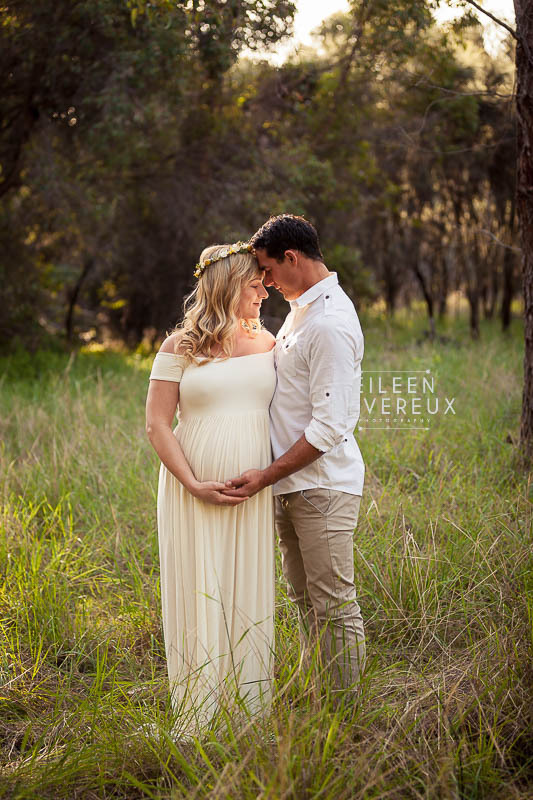 So, with that in mind, I've put together a few simple maternity photography ideas to inspire your work. Using a frame within a frame is a tried-and-true strategy for helping to bring attention to the subject. But the inverse is true, too - frames also help you simplify the composition by helping viewer's pay less attention to what's outside the frame. In the example above, the lines created by the boardwalk's railings act as visual barriers, helping our eyes to rest upon this gorgeous expecting mother. The bright white gown she's wearing and her positioning in the middle of the frame certainly help as well, but those lines are primarily what keeps our attention on the subject. Frames don't have to be quite so evident to be effective, though. In the image above, the model is framed by three elements - the window, the curtains, and the candles, yet all of those different frames work well together and aren't visually overwhelming. That's the key to using frames - make sure they serve their purpose but without having so much visual weight that they overtake the image. I love a pop of color in a portrait to give the subject a little extra visual interest. But sometimes, toning things down and having multiple layers of the same color can be quite fetching, too. Note in the image above how the photographer used various shades of black to create a muted color palette. By doing so, mom's baby bump (and her relationship with her significant other) is more fully on display. If you aren't sure about going monotone throughout the entire image, try doing so with just the wardrobe choices. For example, in the image above, the various shades of creams and whites that the couple is wearing help provide a sense of cohesion between them (which is also helped by the way they're posed). By dressing the couple in shades of white, it also helps set them apart from their surroundings. So, something as simple as color (and toning it down), can help you create clean, uncluttered maternity portraits. Another way to simplify your maternity photos is to use light - or in this case, the lack thereof - to increase the drama of your images. In looking at the image above, you can see this simply lighting strategy at work. The single light illuminating the subject from the side helps show off her baby bump while also giving us a good look at the form-fitting knit gown that she's wearing. By keeping the background totally dark, the photographer is able to simplify the shot such that this mom-to-be takes center stage. In the image above, you can see again that the dim lighting helps to simplify the composition. This time, however, the brightness of mom's gown and the fact that you can actually see the background help this shot be a little more on the bright side, but without sacrificing the simplicity of using simple lighting. Typically, portraits are fairly closely framed on the subject, that way your eyes don't wander around the scene and you have a close enough view to see the subject's features. But that doesn't mean that you can't take a wider shot, maintain the simplicity we're striving for, and still show off mom's baby bump. It's beautiful in its simplicity, with mom set in front of a non-descript background. That also affords us a prime view of her baby bump. But what makes the shot, if you ask me, is that vibrant, red gown that gives the image just enough visual pop to make it especially eye-catching. In this example, we see a different take on making a wide shot. Though this image is a little more tightly framed on the subject, by shooting in a vertical orientation, the photographer captures a nice view of the sky, whose color contrasts beautifully with the dark, rich amber color of mom's gown. What's more, the vertical orientation also allowed the photographer to incorporate some of the foreground plants which add texture and depth to the shot. Just imagine this image if it had been tightly framed on mom from the knees up. It wouldn't have been as successful! 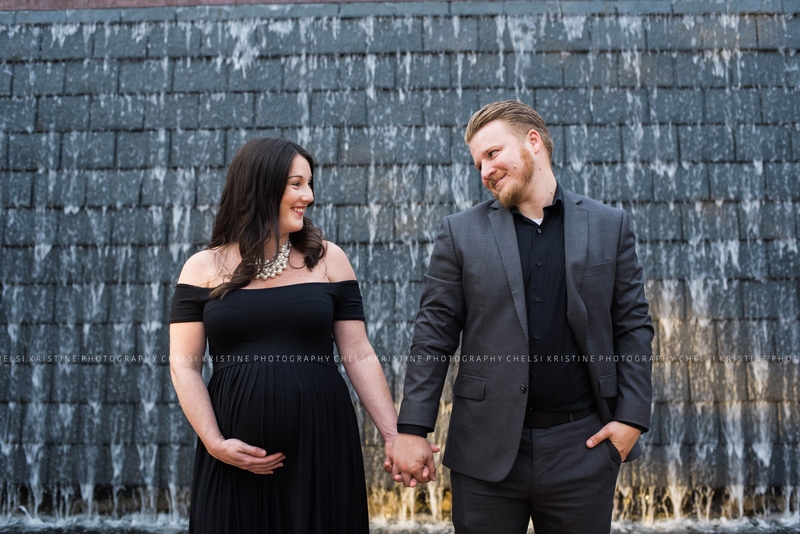 When it comes down to it, finding ways to simplify your maternity images yet still create something that's eye-catching and beautiful might only require that you rethink how you frame the image, how you light the image, or how you use colors.